An allergy is very much like a train wreck with scattered debris chaotically flung everywhere, only the wreck is within a person. Of course, many people who are allergic will have symptoms that cause havoc to their composure, interfere with their lives, and make them feel absolutely miserable. Although there are symptoms which are not severe enough to cause such results, even the slightest allergy symptoms will cause discomfort. For example, an allergic reaction to pollen may cause red, watery eyes, sneezing, a mild headache perhaps, and even a cough or two, depending on the person who is allergic. These symptoms certainly do cause discomfort, making the person feel that he or she is in the first stages of a common cold slightly miserable yet, still functioning. However, another individual with the same pollen allergy might well experience a disabling headache, persistent, unrelieved coughing, heavy chest pain, and painful wheezing. This is certainly no slight allergic reaction it is a train wreck! In both cases, both have experienced an allergic attack. It does not matter how slight or severe the allergic reaction has been; both will want their symptoms relieved and their allergies stopped in their tracks. Sometimes, though, putting the brakes on allergies and their symptoms appear to be a very difficult proposition. For some people, of course, as illustrated, their allergies may not seem as serious whereas others have severe and even frequent recurrences. This simply shows how allergies can vary from individual to individual where their allergies are concerned: what they are allergic to and just how serious are their allergies. Symptoms can vary. Allergies can be slight, true; but caution must be taken regarding any allergy. Allergies, if left untreated, can grow worse until health is at risk. Some allergies can be deadly, such as an allergy to peanuts, shellfish, or some insect stings. Anaphylaxis is the term for a life-threatening allergic reaction in a person who has grown hypersensitive to a certain trigger. When the allergic reaction strikes, the body’s immune system overreacts explosively (called anaphylactic shock). Almost the entire body becomes impacted: the upper and lower respiratory system, cardiovascular and gastrointestinal systems, as well. The shock can result in swelling, abdominal cramps, difficulty in breathing, diarrhea, vomiting, circulatory collapse, coma and death. Ultimately, no allergy should be disregarded. Although, it may seem overwhelming to manage allergies, it can be done. Allergy symptoms can be lessened if certain precautions are taken. The intensity and frequency of symptoms can be reduced with the proper treatment. The very first step in proper treatment is making the visit to a physician for a complete physical; on doctor’s orders visit an allergist who will thoroughly test for allergies and triggers. Medication may be prescribed, along with over-the-counter antihistamines. Even allergy shots may be given to the person with allergies. 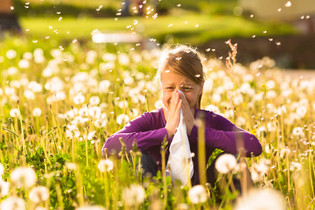 To stop the allergies in their tracks, the individual may have to avoid going outdoors during the allergy season. If necessary, though, to step outdoors, the individual may wear a mask or some kind of head covering. Furthermore, he or she may use a solution to spray in the nostrils to rinse out any pollens or dust. Another precaution is to drink as much water as possible which is an excellent way to banish allergy symptoms. Water flushes out much of the toxins in the body that will accumulate through the day, which also includes some allergens that are within the body. Practicing good personal hygiene will help, as well. An individual should wash hands frequently, not touch the face or nose if outdoors or among people, and bathe and wash hair after staying outdoors for a period of time, which are all good habits to practice. Finally, getting plenty of rest, eating a balanced diet, and visiting the doctor and/or allergist regularly are also part of stopping those nasty allergies in their tracks.